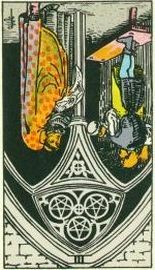 The Three of Pentacles represents work/professional situations. When reversed, the energy therein goes off the rails. Therefore, expect conflict among those who should be working together, which then causes delays. Management level workers are not immune to the situation and will probably offer poor guidance and criticism rather than solving a problem at its root. I see this as the norm for the holiday season. Everyone is stressed about getting everything done to create a "perfect" celebration of a particular holiday. This private stress spills into the professional world and makes everyone cranky and disagreeable. Also, some may try to selfishly take extra days off to ease their own burden, but it simply shifts the burden onto other co-workers. What to do? Self-care, self-care, and more self-care. No, you don't get to be the one taking extra days off. You'll be the one who interacts with all those Scrooges with humility and courtesy. How is that fair, you ask? Because reacting with ease and confidence to a heated situation keeps you from becoming tense and soothes everyone else's temper as well. If you must, stay out of the break room and simply do your work to your very best ability. Let the chaos rage around you but don't participate. You be the island of calm for others and yourself.